The Sussex Foot Centre is a patient-centred Chiropodist and Podiatrist practice in Haywards Heath, West Sussex, offering assessments, diagnostics and a wide range of treatments for the feet and lower limbs. As well as traditional footcare for corns, callus, fungal problems and verrucae, we also offer nail surgery, biomechanical assessments and gait analysis and are able to treat many complex foot problems and conditions. We have extensive experience in treating foot problems in people with chronic conditions such as diabetes, rheumatoid arthritis, peripheral vascular disease, muscular dystrophy, cerebral palsy and other health problems. We have invested in a diagnostic ultrasound machine to ensure you get a speedy diagnosis and can get treatment for painful foot problems straight away. It’s always our aim to get people better fast using the latest technologies and foot care techniques. We also offer a specialist orthotics service to improve foot function and alleviate foot pain. Our custom-made insoles can help many painful conditions, such as plantar fasciitis, shin splints, high or fallen arches, bunions, achilles tendonitis, knee problems and lower back pain. 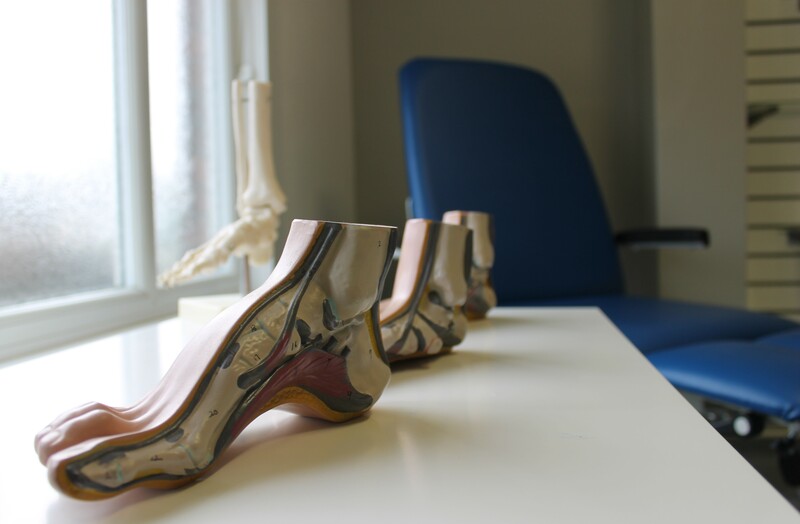 Our highly trained team are able to carry out general and more complex foot treatments, including minor surgeries and can administer cortisone injections for persistent problems in the foot and ankle that haven’t responded to prescribed care. Follow the form below to get through directly to one of our Podiatrists at the practice. All of our specialist foot care services are carried out in our relaxing consulting rooms in Haywards Heath, West Sussex by fully trained and highly experienced chiropodists and podiatrists. We offer disabled access but are happy to arrange home visits for those with mobility issues. We pride ourselves on providing the highest quality foot care for our patients. Our expert chiropodists specialise in the diagnosis and treatment of foot ailments and provide ongoing palliative care and advice, for conditions such as corns, callus, thickened nails, cracked heels, athletes foot, verrucae, and much more. While chiropody focuses on routine foot care, podiatry also includes Biomechanics: the assessment, diagnosis and treatment of a wide range of health problems affecting the feet and lower limbs. Our Podiatrists carry out nail surgery and can administer cortisone injections for conditions unresponsive to conservative care. We believe in getting people better quickly. That’s why we’ve invested in a state-of-the-art diagnostic ultrasound machine to give you a real-time diagnosis enabling us to see exactly what is going on and get started with treatment straight away. Ultrasound is one of the safest types of imaging tools and has no contraindications. Having diabetes means you are at much greater risk of developing foot problems. Raised blood glucose can damage to the sensation in the feet and circulation is also affected. As a result, injuries to the feet in diabetic patients are much more common and problematic. At the Sussex Foot Centre we understand how important footwear is to maintaining healthy feet. We offer a wide range of comfort footwear from leading brands, including Padders and DB (EasyB). We stock width fittings from sizes EE to 8E, to ensure you get shoes that fit you perfectly. Our Podiatrists are registered with The Society of Chiropodists & Podiatrists and the Health & Care Professions Council (HCPC). We provide outstanding services in the heart of Mid Sussex with the aim of improving your health from the feet up! Plantar Fasciitis Treatment, What’s Involved?